The only way to get to Mount Robson Provincial Park is by vehicle. 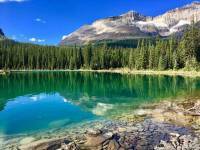 The park is about one hour west of Jasper and 5 hours from the nearest major airport in Edmonton. Few Canadian Rocky Mountain tours make a stop here. 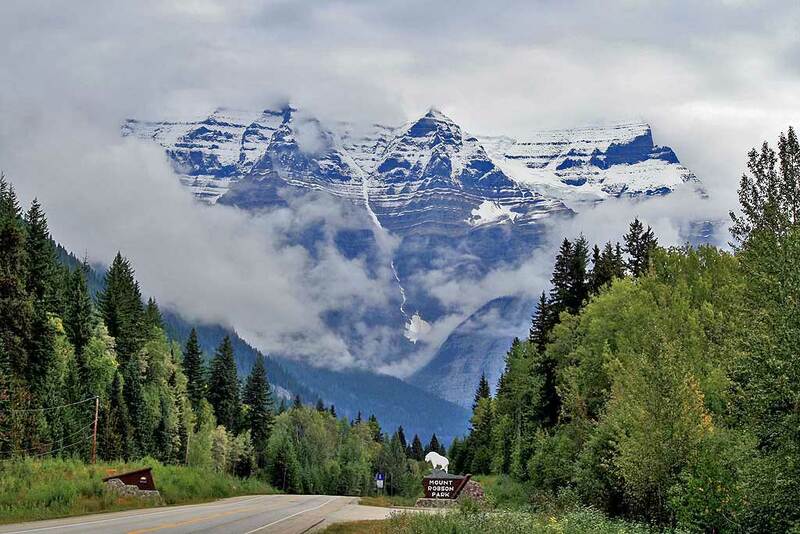 So, it’s best to plan to get to Mount Robson Provincial Park on your own. 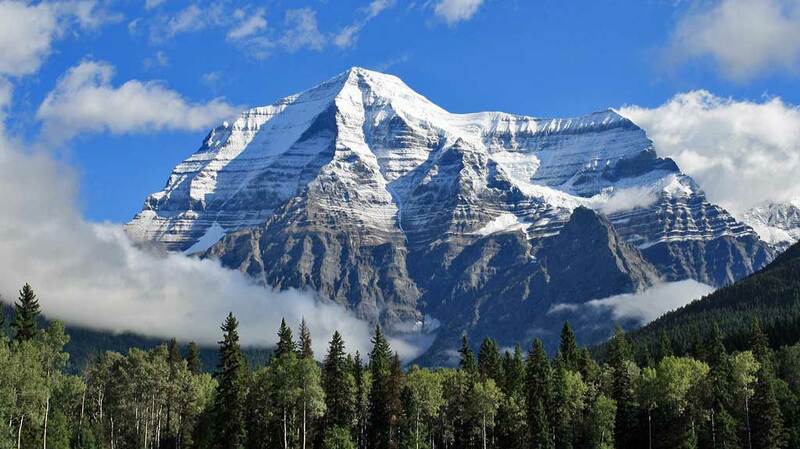 Many people come here just to see Mount Robson, the highest peak in British Columbia. 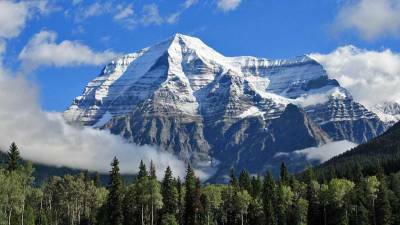 The views are very impressive because Mount Robson looms 10,000 feet over the valley floor. In comparison, the peaks around Banff are about 5,000 feet above the valley. So, Mount Robson looks gigantic when you see it in person. The area became a UNESCO Canadian Rocky Mountains World Heritage Site in 1990. The Yellowhead Highway passes directly along the southern face of the mountain. Vegetation here is more deciduous and lush than Jasper National Park, because moist air from the Pacific runs into the continental divide here. 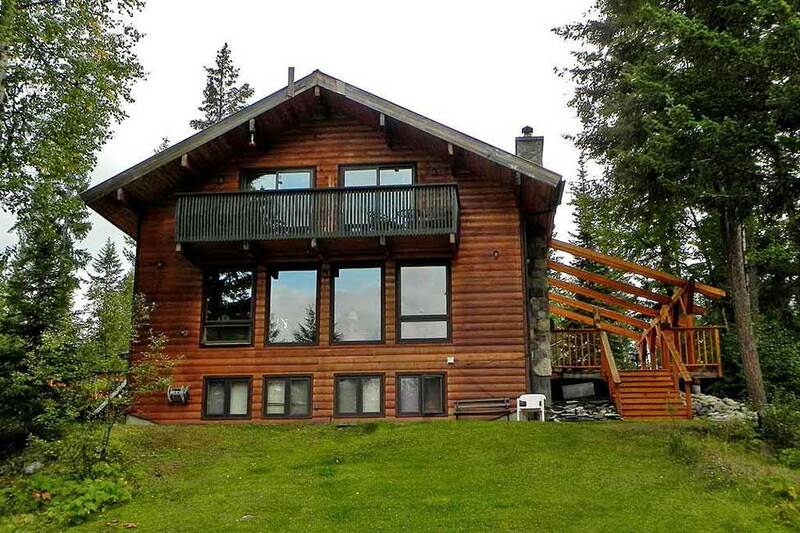 For our visit to Mount Robson Provincial Park, we stayed at the Mountain River Lodge. 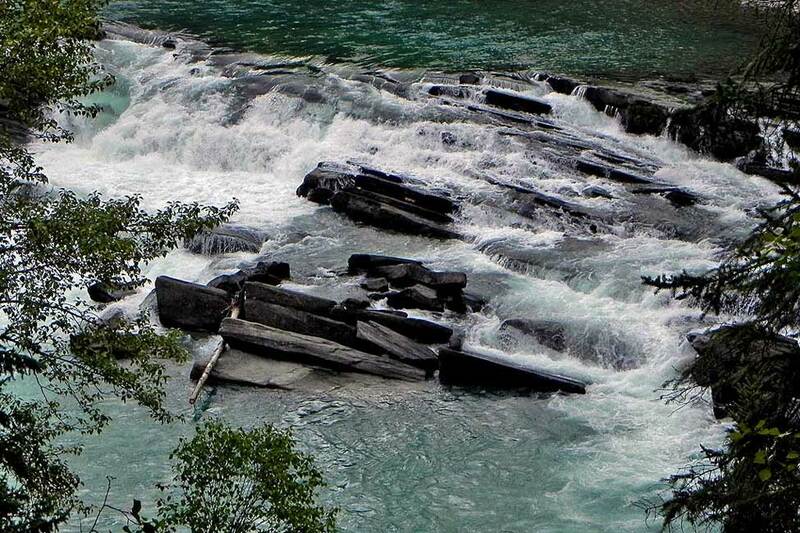 It’s a few minutes by car south of the entrance to Mount Robson Provincial Park. 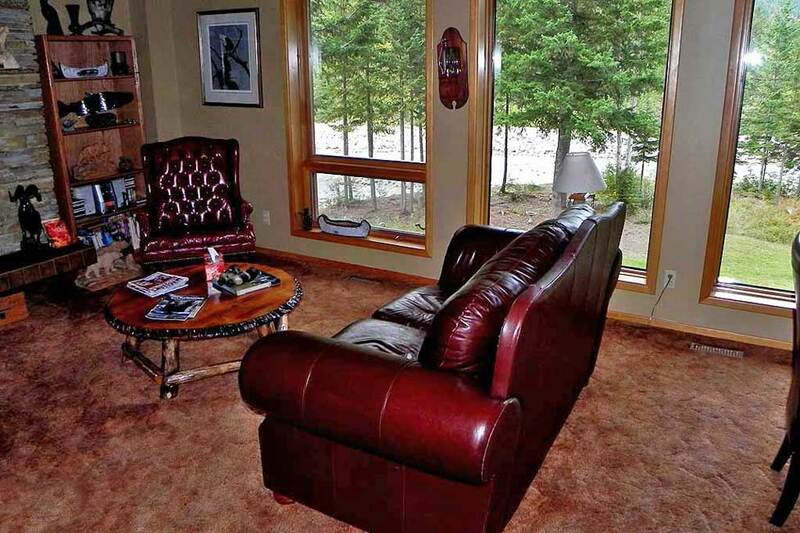 The Mountain River Lodge is a Bed & Breakfast on Swiftcurrent Creek. The lodge has excellent views of Mount Robson from the living room, the dining room and the two north facing bedrooms on the top floor with private baths and balconies. At the back are two more units that don’t have the mountain view. The hospitality was excellent at the Mountain River Lodge and it was enjoyable to meet fellow travelers and share a meal. I spent most of the time in the living room waiting for Mount Robson to emerge from the clouds. I saw a lot of it, but never the whole mountain at one time. 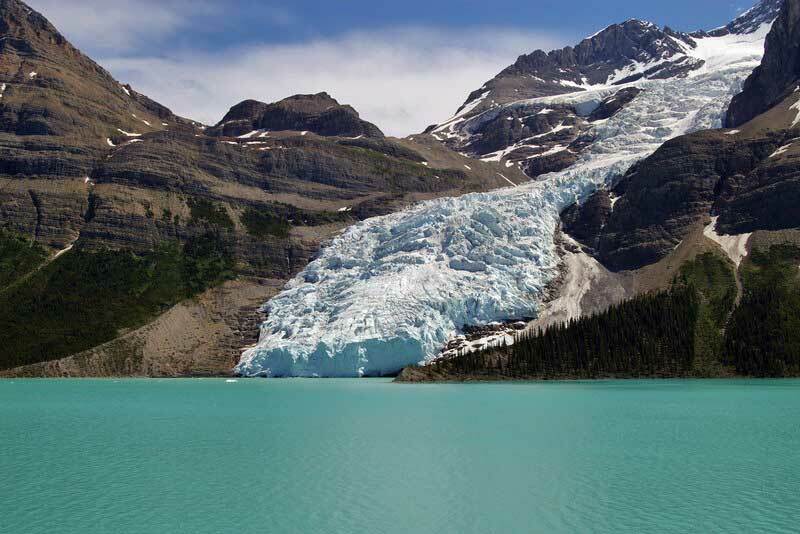 Hikers come to Mount Robson Provincial Park to hike the Berg Lake Trail. The Berg Lake Trail takes you to the shores of Berg Lake where you get great views of the Berg Glacier. We started up the Berg Lake Trailhead, but didn’t have enough time to reach Berg Glacier. The Berg Glacier is on the shaded north side of Mount Robson, which protects it from the heat of the sun. So, Berg Glacier is very large and it runs right in to Berg Lake. It’s on my list to come back again and do this hike. On the way to Berg Lake, you can camp at Kinney Lake and Emperor Falls. The first part of the trail to the Kinney Lake Campsite doesn’t have much change in elevation and you can do a return trip to Kinney Lake in 2.5 hours. You won’t see the lake or the Berg Glacier at Kinney Lake Campsite though. The Berg Lake Campsite is at the far end of Berg Lake. From the Berg Lake Campsite you can hike straight up to the tree line and then head back above the tree line. The views of the lake and the glacier below you are fabulous when you make the extra effort to get up above the lake shore trail. If you hope to reach the Berg Lake Campsite and return the same day, you need to allow 12 hours. 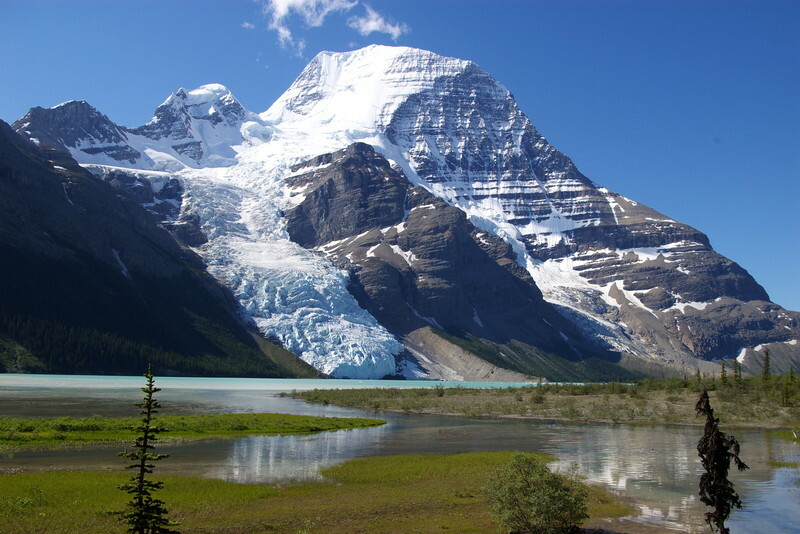 Staying the night at Emperor Falls Campsite on your hike is a great way to enjoy Berg Lake and Mount Robson Provincial Park.